WASHINGTON, DC, November 19, 2014 (ENS) – Senate Democrats are not backing away from the climate change fight, even after the midterm elections shifted the balance of power in Congress to the Republicans, many of whom are in a state of climate-change denial. U.S. 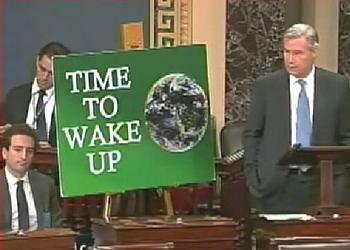 Senator Sheldon Whitehouse, a Rhode Island Democrat, today introduced a bill that would place a fee on emissions of the greenhouse gas carbon dixoide (CO2). The American Opportunity Carbon Fee Act would require polluters to pay a fee for every ton of carbon they emit. The fee would start at $42 per ton in 2015 and increase annually by an inflation-adjusted two percent. “We all pay the costs of this subsidy through higher health costs, property damage from rising seas, warming waters that affect our fishing industry, and more,” he explained. If this measure beomes law, all revenue generated by the carbon pollution fee would be credited to an American Opportunity Fund to be returned to the American people. Whitehouse suggests possible uses that include: tax cuts, social security benefit increases, tuition assistance and student debt relief, infrastructure investments, climate mitigation or adaptation, and reducing the national debt. The fee would be assessed on all coal, oil, and natural gas produced in or imported to the U.S. and cover large emitters of non-carbon greenhouse gases and carbon dioxide from non-fossil-fuel sources. The U.S. Department of Treasury would assess and collect the fee, working with the Environmental Protection Agency and Energy Information Administration to ensure the best research methods and data are used. A study from Resources for the Future, a non-partisan think tank, estimates that a carbon fee tracking the social cost of carbon would reduce carbon pollution by about 50 percent within a decade from the electricity sector alone compared to business-as-usual. The electricity sector is the largest source of carbon pollution, about 40 percent of annual emissions. WASHINGTON, DC, November 19, 2014 (ENS) – Partners in a unique project aimed at preserving grasslands and reducing carbon releases are celebrating Chevrolet’s decision to purchase the first-ever verified carbon offsets from the avoided conversion of at-risk grasslands to cultivation. The certified project, the first of its kind, is expected secure nearly 40,000 metric tons of greenhouse gases. The agreement, involving the partnership of Ducks Unlimited, The Climate Trust, Bonneville Environmental Foundation and Chevrolet, was announced Monday at a U.S. Department of Agriculture news conference. The purchase agreement was negotiated by The Climate Trust with BEF on behalf of Chevrolet and its Carbon Reduction Initiative. Chevrolet’s ambitious climate goals include reducing up to eight million metric tons of greenhouse gas emissions over a period of five years that began in 2010. Led by Ducks Unlimited, the project is based on a new carbon accounting protocol housed with the American Carbon Registry that was supported by the USDA through a Conservation Innovation Grant. The protocol allows project developers to work with landowners to proactively protect grasslands at risk of cultivation, which releases below-ground carbon reserves into the atmosphere. The project, spanning six counties within the Prairie Pothole Region of North Dakota, also enhances water retention and flood control. The Prairie Pothole Region stretches across Montana, North Dakota, South Dakota, Minnesota and Iowa and has averaged annual losses of native grasslands of some 50,000 acres per year. This region, called the “Duck Factory,” is the breeding grounds for about half of all migratory ducks in the country. Waterfowl and other wildlife rely on its mix of prairie and wetlands for nesting and rearing habitat. Local livestock producers rely on its grasslands to feed their cattle. But mounting pressures to convert grazed grasslands to cultivated cropland has resulted in the Prairie Pothole Region being labeled one of the most endangered ecosystems in North America. The prairie landscape is also an important forage source for local livestock producers. Market conditions and farm policy within the last decade have added pressure to convert grasslands to row-crop production. Once converted to cropland and livestock infrastructure is removed, the chances that it will return to grass in the future are greatly reduced. In 2010, Chevrolet, made one of the largest voluntary commitments to greenhouse gas reduction in U.S. history – up to eight million tons of CO2 emissions, equal to the 2011 emissions from driving the 1.9 million new Chevys sold that year. This project fulfills part of that commitment. ANCHORAGE, Alaska, November 19, 2014 (ENS) – Global warming has driven a 40 percent decline in the number of polar bears in eastern Alaska and western Canada, a new study finds. The Southern Beaufort Sea polar bear population has dropped to just 900 bears from the last estimate in 2006 that documented more than 1,500 bears. These polar bears live in eastern Alaska and western Canada and are one of only two polar bear populations in the United States. Between 2004 and 2006, “unfavorable ice conditions” limited the polar bears’ access to ice seals, their favored prey. Cubs were hit especially hard; only two of the 80 cubs observed in Alaska between 2003 and 2007 are known to have survived. Polar bears depend on Arctic sea ice for their survival, but climate change is rapidly melting the Arctic sea ice. In September 2012 Arctic summer sea ice reached a new record low minimum extent, losing an area about the size of Texas since the previous record low in 2007. The Southern Beaufort Sea population appears to have stabilized between 2008 and 2010, possibly due to unusual oceanographic conditions, less competition, or because some polar bears stayed on land during the summer, feeding on subsistence-hunted bowhead whale carcasses, the study’s authors say. In 2008 the United States protected polar bears as “threatened” under the Endangered Species Act, predicting that more than two-thirds of the world’s polar bears would be extinct by 2050. Conservationists say the bears deserve the stronger “endangered” species designation. Nevertheless, polar bear hunting remains legal. While the United States permits only native subsistence hunting, Canada allows both sport hunting and hunting for the rug trade. Canadian polar bear hunting is on the rise, as fur prices have tripled since 2007. The Center for Biological Diversity is working to strengthen polar bear protections in the United States and worldwide. Nations will be considering a total ban on commercial trade in polar bears in 2016. WASHINGTON, DC, November 19, 2014 (ENS) – The U.S. Forest Service Tuesday released a final plan for management of the George Washington National Forest that does not prohibit the controversial practice of fracking, or hydraulic fracturing. When fracking, oil and gas companies pump millions of gallons of water laced with a proprietary chemical cocktail deep underground under high pressure to release hydrocarbons trapped in shale layers. Critics allege it pollutes groundwater and adversely impacts human health. “This forest plan provides a balance of management direction that addresses both the long-term ecological sustainability of the George Washington National Forest, as well as the long-term social and economic needs of those that depend on or are impacted by the Forest,” said Southern Regional Forester Ken Arney. The plan limits availability for new oil and gas leasing in the in the 1.1 million acre forest. The plan also puts off limits another 800,000 acres that were available for drilling. It establishes a framework for potential development on about 10,000 acres where there are existing valid leases, as well as on 167,200 acres with existing private mineral rights. “The decision does not prohibit any specific technology for developing oil and gas resources, including hydraulic fracturing. Any proposal to develop existing leases on the Forest would undergo additional environmental analysis and provide opportunities for public comment and engagement,” said Arney. The plan allows fracking only on national forest lands in Virginia’s rural Highland County. In an earlier version of the plan, released in 2011, the Forest Service proposed to ban fracking on the entire George Washington National Forest, the first such ban of the practice proposed for a national forest. But the agency responded to the complaints of energy companies over the objections of environmental groups and local elected officials. Presently, none of the existing federal leases or existing privately owned mineral rights on the Forest are active, and no mineral development is occurring on adjacent private lands. The plan recommends congressional designation for a 90,000 acre National Scenic Area on Shenandoah Mountain located in Rockingham, Augusta, and Highland counties and the designation of 27,000 additional acres to the Wilderness Preservation System. The plan also includes increased streamside protections. Some 2.7 million people in Northern Virginia and Washington, DC rely upon the George Washington National Forest for a portion of their water supply. The Forest is the largest federal landholding in the Chesapeake Bay watershed and is the direct source of drinking water for about 262,000 people in local communities in and around Virginia’s Shenandoah Valley. RESEARCH TRIANGLE PARK, North Carolina, November 19, 2014 (ENS) – The amount of illegally harvested wood from South America and Asia available for export to the United States is smaller today than it was six years ago due to a change in U.S. law, finds new research by U.S. Forest Service economist Jeff Prestemon. In a study on the effect of a 2008 amendment to the Lacey Act, a U.S. wildlife protection and anti-trafficking law, Prestemon found that the prices of lumber and hardwood plywood imports into the United States from suspected illegal wood fiber source countries have increased and their quantities have decreased since the enactment of the 2008 Lacey Act Amendment, indicating a decrease in export supply in these countries. Prestemon, project leader of the Forest Service Southern Research Station Forest Economics and Policy unit, used monthly import data from 1989 to 2013 to evaluate the effects of the 2008 amendment. “The Journal of Forest Policy and Economics” has published the results online. “These findings are evidence that the amendment has met at least some of its advocates’ objectives,” said Prestemon. The original Lacey Act of 1900 focused on wildlife, with later amendments expanding to plants, including trees and wood products. The Lacey Act Amendment of 2008 was enacted to cut the global demand for illegally obtained timber products, and includes for the first time any tree species illegally obtained in the country of origin and any product, such as wood, paper, or pulp, containing illegally obtained material. “There has been growing distress around the world about the negative effects of illegal fiber sourcing, including logging, on forests, people, wildlife, and the rule of law in countries suspected of producing such wood in large quantities,” says Prestemon. The U.S. consumes a small share of wood from countries with high rates of illegal timber, but having illegal wood on global markets depresses wood prices globally and that affects U.S. producers, says Prestemon. “In the U.S. and elsewhere, timber growers and wood product manufacturers have been concerned about the effects of illegal logging on their market prices and market shares, in both domestic and foreign markets,” he said. The Lacey Act makes it a crime to import onto U.S. territory or to transport across state lines any illegally obtained plant or animal species or product made with them. Prestemon says more study is needed before we can judge the 2008 amendment as a complete success in reducing illegal wood sourcing. “First and foremost we need to understand to what extent illegal producers have diverted their illegally sourced fiber exports away from the U.S. and toward countries that don’t have such trade measures,” said Prestemon. “Second, we need to look at possible substitutions within countries suspected of illegal sourcing, where producers decide to only export legal fiber but still illegally produce, diverting those products toward domestic consumers in their own markets,” he said. In 2010 the European Union enacted similar legislation that bans the import of illegally sourced fiber, and other wood product importing countries are either contemplating or are now implementing similar trade measures. ANCHORAGE, Alaska, November 19, 2014 (ENS) – XS Platinum, Inc. and five of its officers and employees were indicted by a federal grand jury in Anchorage today for five felonies, including conspiracy to violate the Clean Water Act and making false statements to federal officials. Two Australian citizens and one Canadian were indicted along with two Americans, said Sam Hirsch, acting assistant attorney general for the Environment and Natural Resources Division of the U.S. Department of Justice, and Karen Loeffler, U.S. attorney for the District of Alaska. According to the indictment, XSP held 159 placer mining claims and 36 hard-rock claims totaling more than 4,000 acres at the Platinum Creek Mine, which was situated along the Salmon River and its tributaries. The mine contains placer deposits of platinum, along with smaller amounts of gold and palladium. All but 21 of the claims were on land managed by the Bureau of Land Management, with the remaining undeveloped claims lying within the Togiak National Wildlife Refuge. The Salmon River is important for the spawning of all five species of Pacific salmon – and the rearing of coho and sockeye salmon. After flowing through BLM land, the Salmon River crosses the Togiak National Wildlife Refuge before entering the Pacific Ocean at Kuskokwim Bay. The Clean Water Act prohibits discharges of industrial wastewaters from mining operations in violation of CWA permits which govern those discharges. According to the indictment, in 2010 and 2011, XSP and the individual defendants knowingly discharged industrial wastewaters from XSP’s mechanical placer mining operation at the Platinum Creek Mine into the adjacent Salmon River in violation of XSP’s Clean Water Act General Permit. But XSP told federal regulators in its mining and Clean Water Act permit applications that the operation of the mine would recycle all of its wastewater and result in “zero discharge” of mine wastewater to the Salmon River. The indictment alleges that XSP and the individual defendants conspired to violate the Clean Water Act by concealing the 2010 and 2011 mine wastewater discharge violations from federal officials, and submitting material false statements to federal agencies. XSP and its corporate officers submitted an annual report in 2011 to federal and state agencies which indicated that the mine had “zero discharge” during the 2010 mining season, when XSP’s own monitoring data showed that it had numerous discharges to the Salmon River. Named in the indictment are: Dr. Bruce Butcher, 59, and Mark Balfour, 62 (both Australian citizens), James Slade, 57 (a Canadian citizen), and Robert Pate, 62 and James Staeheli, 43 (both U.S. citizens residing in Washington state). An indictment contains allegations that a defendant has committed a crime. Defendant are presumed innocent until proven guilty beyond a reasonable doubt.